Cowleys Pest Services has been providing exceptional pest control services in New Jersey for nearly three decades. The family owned and operated company brings along extensive experience when handling your residential or commercial pest control problem. After all, there’s a good reason why they are called pests! If you've ever had an infestation, you know first hand just how annoying they can be. If it crawls, flies, hops, jumps, or slithers, and it's taken up residence in your home or business, call the trusted professionals at Cowleys Pest Services to get them out of your home or property. We understand the importance of doing the job right the first time and we strive for excellence in our practices and customer service to you. Give us a call for a pest control price estimate and let us know how we can help fix the problem in your home. In 1991, Drew Cowley founded Cowleys Pest Services. After working as a one-man operation for four years, his brother Bill joined the company. The brothers immediately developed a seamless working relationship, knowing each other’s strengths and aptitudes. Not surprisingly, Drew and Bill share the same high ethical standards and customer-first philosophy in operating a business. The rest is history. The partnership between Drew and Bill, along with a dedicated staff and commitment to the pest management business, set the standard for pest control services in Mercer, Ocean, Monmouth, Middlesex County. "Worked with your sales rep and tech at another company"
"previous experience with your sales rep and employees. The..."
What began as a tight-knit family business has expanded to more than 35 full-time employees, servicing over 10,000 residential, commercial, and industrial customers in the state of New Jersey. Still, we have maintained that same familial feeling as we've expanded and grown over the years while becoming a top leader in pest control services and extermination. 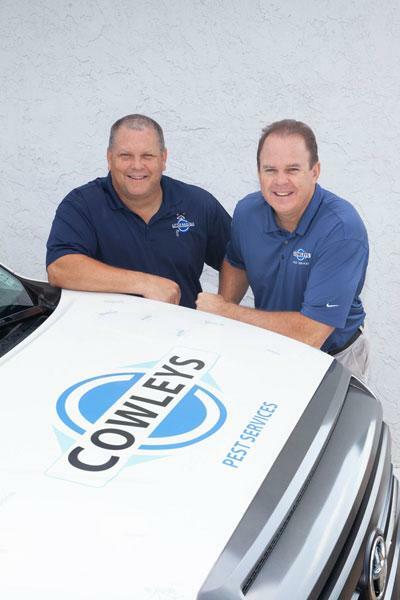 Let the Cowley brothers rid your home of inconvenient pests and critters. We guarantee a high level of service and professionalism and set ourselves apart in a variety of ways. All employees are licensed and certified by the Department of Environmental Protection. Our exterminators in NJ undergo rigorous pre-employment screenings such as background checks, drug testing, and driving history. All employees are continuously trained on a weekly basis in safety and the latest, most effective pest control methodologies. Technicians wear prominently displayed ID badges and uniforms and drive company vehicles. Our wildlife control doesn't harm animals. Our animal control company will humanely trap, relocate, and prevent re-entry of the animals. We are an accredited member of the Better Business Bureau with an A+ rating. We are members of The New Jersey and National Pest Management Associations. We offer a 10% senior citizen discount. Our New Jersey office always has a live person ready to answer your call. If you have a pest control problem, contact Cowleys Pest Services by phone or online today.